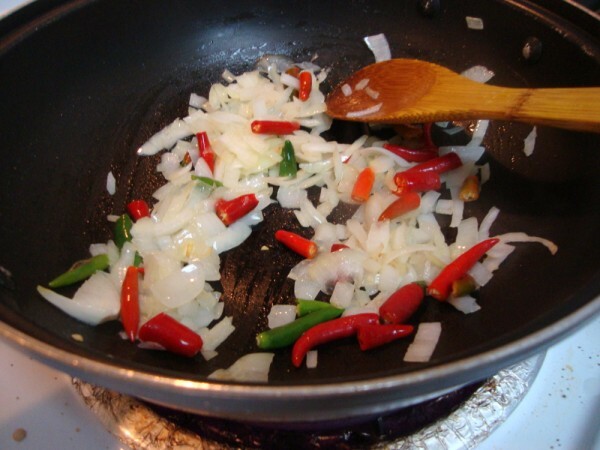 With the way chutneys are made at home, you would assume that Baigan Ka Barta to be a common dish. At least if not called by the same name, in our own native language. However it is not so common, not because we don’t like it, it’s simply not a vegetable that I make so often. Also when I had checked it for an exact meaning on is a dish that has always been in memory for me to make. Daddy loves brinjal and I like it too in most forms. We do make chutneys with it, though not so frequently. Imagine I never made the chutney myself. I know how it is made, so it was quite a surprise when my cousin sister wanted me to make her Baigan Ka Barta with those huge eggplants they get in San Jose. This is what I made for them at about 10.30 in the night during my visit to SFO last year. Yes I have been meaning to use the pictures I never came around posting on this. I thought it was really high time I use the picture, even though we make the dish at home. Even if I have to say it myself, the chutney was lip smacking. When I first came to know about Baigan ka barta, it was in a Sanjeev Kapoor show. Then I realized that as always there are million ways one makes the baiga bartha. The simplest of the chutneys that we make is also referred by the same name. Some add aloo to the dish, some puree the baigan. Well the way you make is your choice! I was really taken in by the market place I went in and was so happy seeing those green, fresh produce. We picked up these huge baigans for the barta. We returned home at about 10 or so and it was nearly half past ten when I decided we are going to make it. It was delicious with just steamed rice and ghee. Wash and wipe the brinjal well. Coat the outer surface with oil and then it’s ready for roasting. 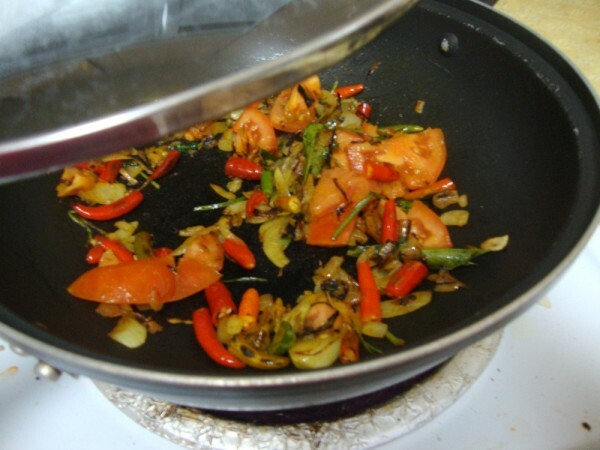 Roasting on the gas cooktop is the most easily and best method you can do to achieve that charred and smoky effect. 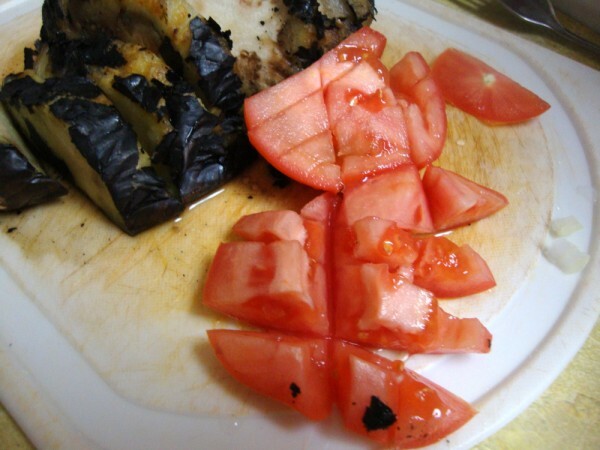 So take the greased eggplant and place it directly on the burner., keep the flame on low. 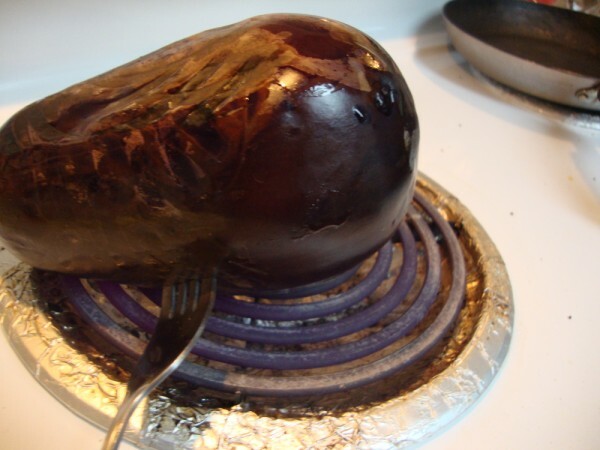 Keep turning the eggplant and make sure all the sides are exposed to flame. 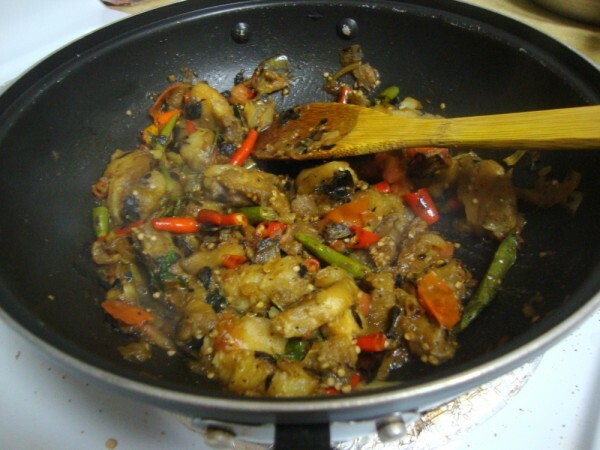 This takes about 5 – 6 mins, depending on how big is the brinjal. 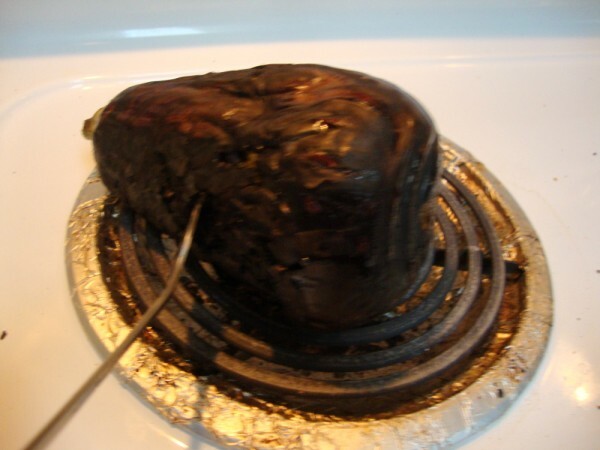 When the brinjal is roasted well, allow it to cool. 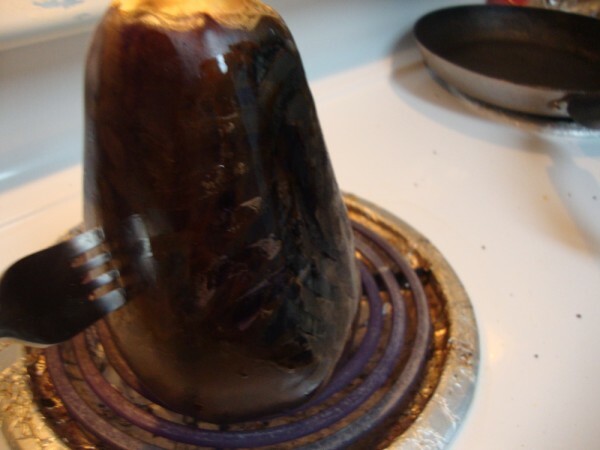 Then remove the stem and the outer charred skin. You can either mash it or add it as such. 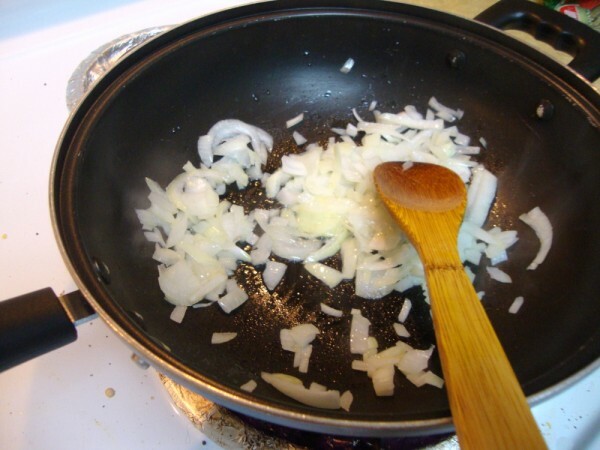 In a non stick pan, add oil and cumin seeds. 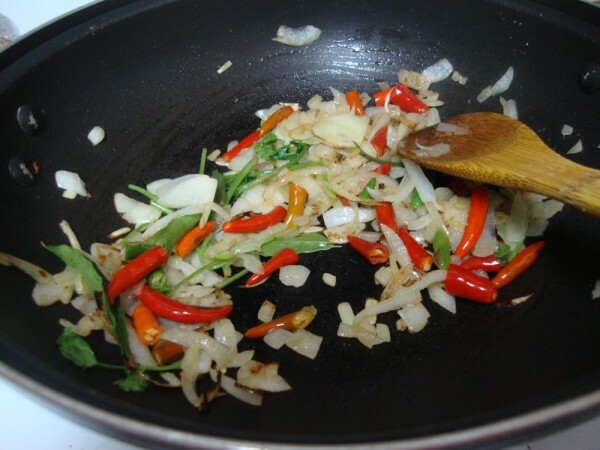 When they start to splutter, add onions, curry leaves, garlic. Keep stirring till the onions turn colour. Then add chopped tomatoes, Add salt, turmeric and cover with lid. Next add the roughly mashed eggplant. 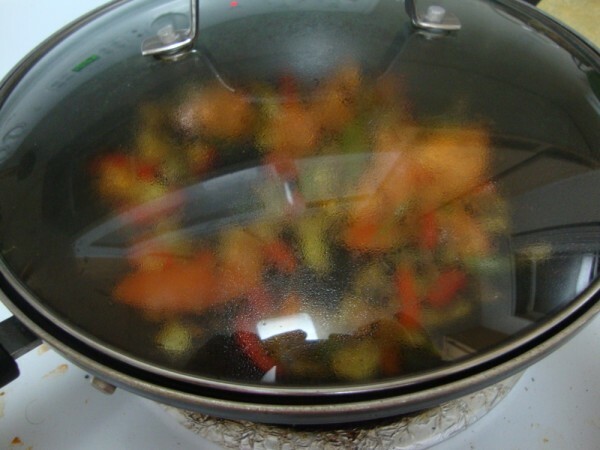 Stir well and simmer for 5 – 7 mins. Using a wooden spoon, mash everything together. I removed at this stage and allowed it cool for blending it further so that it tends to be spicy. So once it’s cooled, take it in a blender/mixer, pulse it couple of times. It should be coarse and not very finely blended. Notes: Please note that I used ripe green chilies, which are not mostly very spicy. 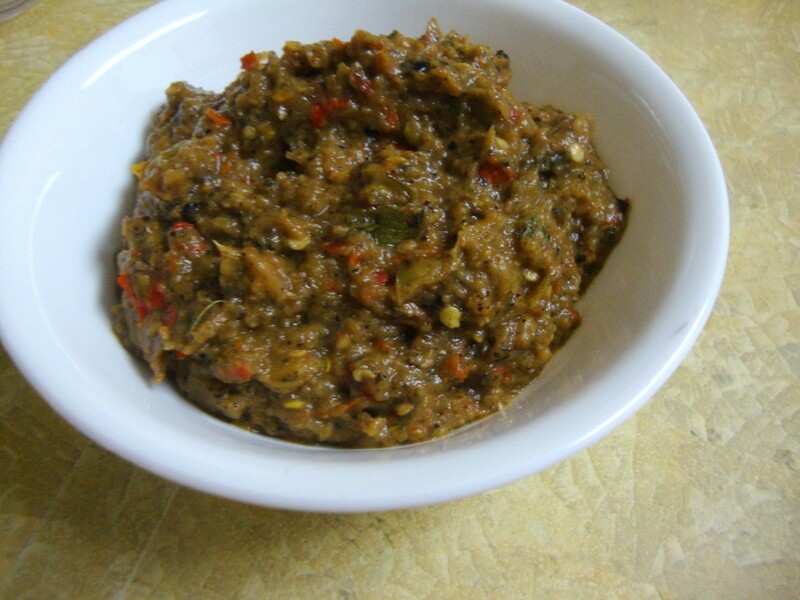 Though the chutney ended up being spicy, you should reduce if you are either using green chilies/ dry chilies. 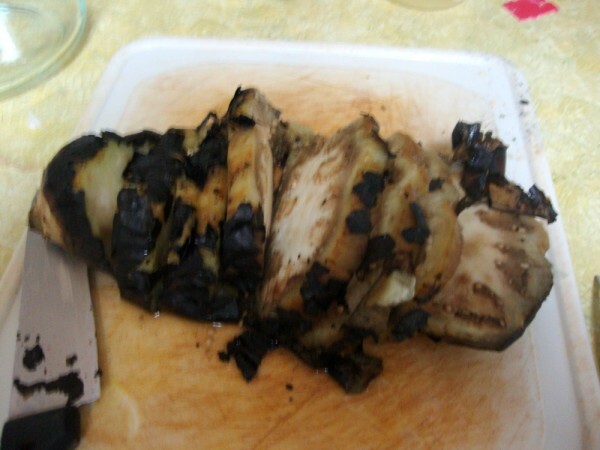 You can also grill the eggplant for making the bharta or Roast in your oven. I have not personally followed this method. I always felt stove gives the best results. This stayed good for a week when refrigerated. Just love this with rotis or even pongal!!!! very good one!..love the smoky flavor…now I miss my gas stove! Looks yummy. Roasting on stove is faster than oven. 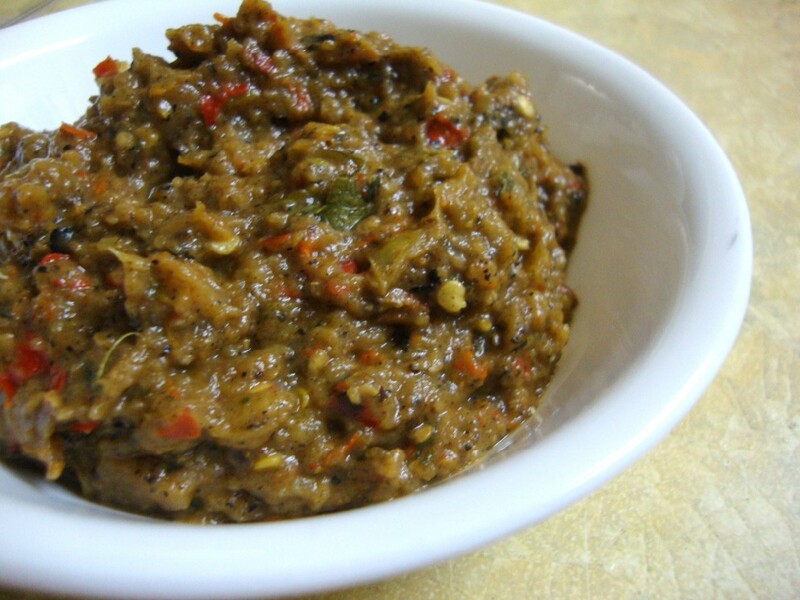 I love baingan bharta with anything, simply inviting.. Cooking at 10 at night- wow! Would have been a delicious late night meal. looks yum ! 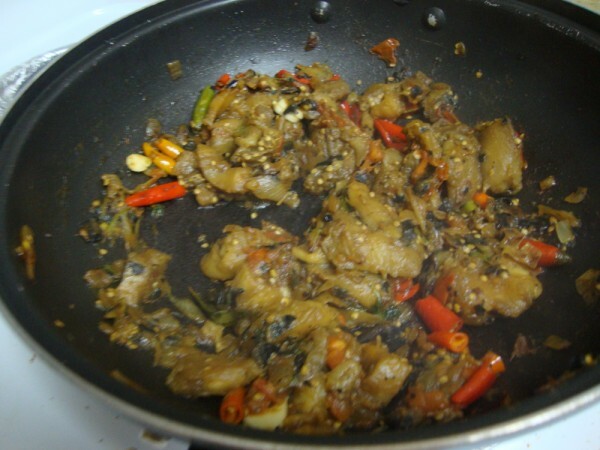 I like brinjal toom and its been some time that I made it.. I made this y'day for dinner. Love this any time. Good step-by-step pics. Good one. 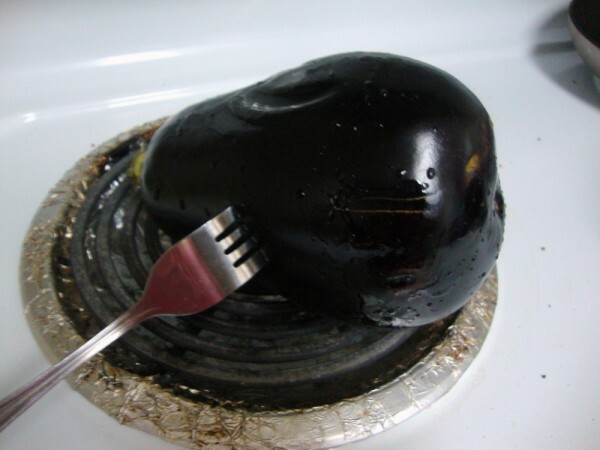 I am allergic to eggplant and my husband doesn't like the stove top grilled eggplant. Instead I bake in the oven for 40 min. Nice try Valli. In the US, you can broil in the cooking range oven. It comes out really well..
Lovely instructions. 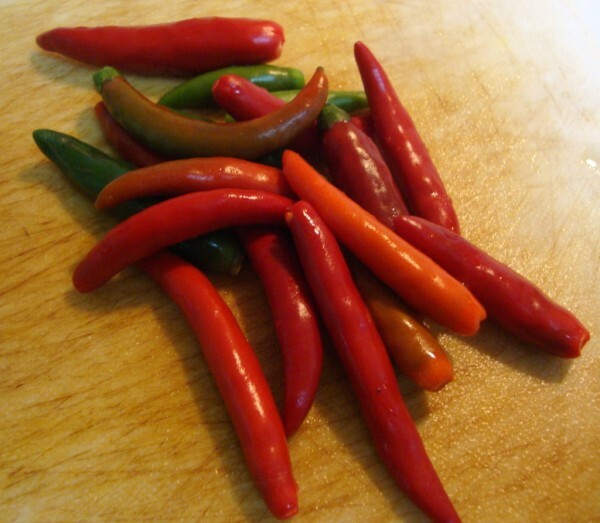 I have done this but not with so many chilies! Looks very tempting. Cooking at 10.30 in the night? Wow, that needs some real dedication :)). The baingan barta looks nice too, would refer this post if I ever decide to make it.